Translated by M. Moatz Al-Hallak. A Close Examination of the Azhar's Verdict. 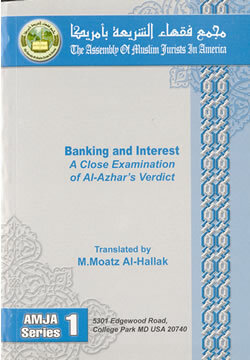 The Azhar Institute of Islamic Research has announced that interest which banks give to depositors is permissible. This came in response to a question from a client of the International Arab Banking Corporation. The booklet provides both the text of the question and the response of the Institute of Islamic Research. Thereafter, follows a detailed commentary from the Assembly of the Muslim Jurists of America on this precedent-setting ruling. Undoubtedly, such a ruling represents a serious deviation in the known practice of either Al-Azhar or any other existing jurisprudential institution. In essence, the announcement contradicts all that these institutions have agreed upon regarding the clear-cut prohibition of interest given by banks. The first and the most senior of these institutions which affirm the prohibition of the banks' interest is the Institute of Islamic Research itself. It passed a resolution on this matter by consensus during its conference in Cairo in 1385 A.H. (corresponding to 1965). The conference was attended by representatives from 35 Muslim countries. AMJA, English, Paperback, Pages: 76.